Feeling the weight of the world on your shoulders? Shoulder and neck pain are one of the most common musculoskeletal conditions across the globe and the cases of this pain are many. What are the common shoulder and neck pain causes? The neck and shoulders are made up of muscles, nerves, tendons, ligaments, bones and small fluid-filled sacs called bursae that cushion them. Injury, wear and tear or damage to any of the muscles, tendons, bones, bursae or ligaments can cause neck and shoulder pain. Bad posture : Sitting hunched for a long time or straining the neck while reading or working. Repetitive motions: Repetitive use of neck and shoulder muscles such as in swimming, painting, basketball and other sports can result in inflammation and strain of muscles. Whiplash injuries: Whiplash injuries are the result of sudden force which throws the neck forward and backward. Such injuries can be sustained in motor vehicle accidents, falls or blow to the neck. Degenerative conditions: Degenerative diseases such as arthritis, cervical spondylosis, and osteoporosis result in chronic shoulder and neck pain. Any of the above conditions result in symptoms including pain, swelling, numbness, weakness and difficulty in moving the neck or shoulders. It is always advisable to consult a healthcare professional before taking up neck pain exercise or practicing yoga for neck and shoulder pain. There are specific poses in yoga for neck and shoulder pain which not only help heal faster, but also prevent recurrences of such pain. Yoga is a holistic approach that originated in the ancient times in India and is now popular across the world. While taking up yoga for neck and shoulder pain, it is important to remember that yoga treats the body as well as the mind. The benefits of yoga go beyond pain relief. Here are some ways yoga works for the body and soul! Relaxation: Yoga teaches you to relax and relieves stress that is another major cause of chronic pain that results from tense muscles in the neck and shoulders. Practicing yoga regularly can help get rid of stress-related habits like tensing up shoulder muscles, jaw clenching and teeth-grinding. Posture correction: Yoga poses help you attain a good posture by realigning the muscles and bones in the proper way. Hunching, bad sitting posture, straining and overuse of neck and shoulder muscles are some very common shoulder and neck pain causes. Energize: Yoga is a holistic spiritual practice that also focuses on re-energizing your entire system. It is a great way to learn how to harness your vital energy in an optimal way without scattering it in wasteful worries and stressors. Focus on breathing: Yoga poses also stress on developing a healthy breathing pattern and becoming more aware of how you breathe. Improved breathing techniques refresh the mind and the body while getting rid of fatigue and chronic pain. There are a few specific yoga postures that can help relieve neck and shoulder pain while strengthening the muscles in these areas. Here are the top picks of yoga poses for neck and shoulder pain relief. 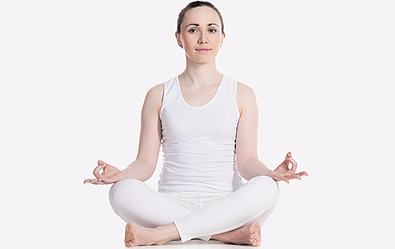 #1: Sitting pose: The basic pose in yoga is the sitting pose called “ Sukhasana” which helps in attaining the right posture for sitting. Sit on a mat with your back kept straight and extend the spine as much as possible. Cross your legs and breathe deeply and slowly. Feel the chest expansion with every inhale and during the exhale feel the navel drawing in to the spine. Breathe deeply while noticing every breath for ten to twelve breaths. Keep the shoulders relaxed and the hands gently folded on the lap. The pose helps in relaxing the neck and shoulder muscles. #2: Cat Cow stretch: Called “ Chakravakasana” the pose resembles both the cat and the cow and relieves tightness in neck and shoulder muscles. Lie down on the mat face down with hands to the sides. Lift the trunk so your body rests on all fours like a cat. The knees are directly below the hips. Inhale deeply and draw in abdominal muscles while arching the back to resemble a frightened cat. The head faces down towards the chin. #3: The Cobra Pose: The cobra pose resemb­­les the locust pose. In Sanskrit, the pose is called “ Bhujangasana” or the snake pose because the raised trunk looks like the raised hood of the cobra. The pose helps tone back, shoulder, neck muscles and reduces stiffness. 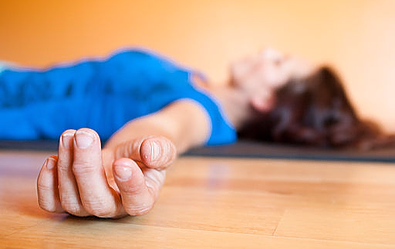 Lie down on the mat just like the locust pose, keeping your feet apart at hip width. Place your arms by the sides, with the palms facing upwards. Inhale deeply and lift the chest, trying to arch your back as much as possible. Keep your hands on the floor at shoulder width. Hold the position for a count of five or ten breaths. #4: The Locust pose: “ Salabhasana” where “salabha” denotes locust or a grasshopper is one of the most effective poses in yoga for shoulder and neck pain. The pose effectively stretches and realigns the shoulder and shoulder blades while stabilizing the neck muscles. The pose opens up and flexes the neck muscles to relieve built up tension in the area. Lie down on a mat facing down. Keep the feet apart at hip width and rest your arms by the sides, with the palms facing upwards. Inhale deeply and lift the chest, hands and arms along with the feet off the mat. Gently draw back the shoulders as much as you can. #5.Standing forward bend: One of the best poses in yoga for shoulder and neck pain is “Uttanasana” or the forward bend. 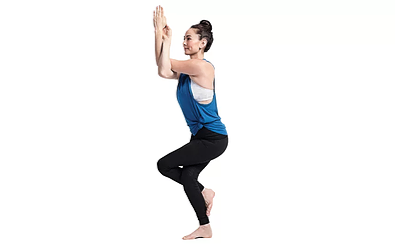 To do this pose, stand straight, keeping the feet apart at hip width and the hands to the sides. Exhale deeply and bring the body down all the way so the face touches the knee or the shin. The chest touches the thighs while the hands reach the ankles to hold them. Uttanasana strengthens the spine and neck while calming the brain. The pose also improves flexibility of back and shoulder muscles. #6: Bow pose: This pose is called “ Dhanurasana” where “ dhanur” stands for a bow. To do this pose, lie flat on the mat face down. Keep arms to the sides. Inhale slowly and bring the feet and ankles upwards in an arch, while stretching your arms backwards to hold the ankles. Lift the upper body at the belly level and stretch the neck back as much as you can. Both the thighs and the chest are off the ground and form an arch resembling a bow. Hold for ten breaths and lower gently. The pose opens up the neck and shoulder muscles, while also toning and strengthening these muscles. #7: Standing Stretch: The standing stretch is the warrior’s pose (“Virabhadrasana”). The pose relieves the deep rooted tensions and tightness in the shoulder, neck, arm and chest. Start by standing straight with legs kept apart at least at a distance of three to four feet. Breathing deeply, turn the left foot to ninety degrees. The other foot should face forwards as before. Keep the body straight and lift both hands parallel to the ground at shoulder level. Exhale deeply and bend the left foot to the direction of the left foot at ninety degrees. Gently try to push the pelvis down as much as possible. Continue breathing deeply and hold the pose for ten breaths. Relax and repeat by switching sides. 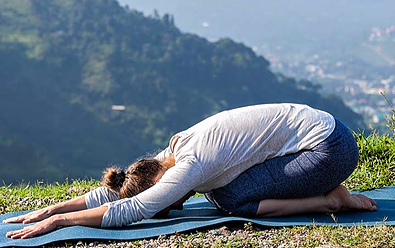 #8: Side angle pose: Called “ Parsvakonasana” where “ kona” denotes the triangular shape formed by the pose, the side angle pose stretches the muscles and relieves pain in neck, arms and shoulder. Start by standing straight on the mat with hands to the sides. Exhale deeply and widen the gap between the feet to 3 to 4 feet. At the same time lift the left arm upwards in the same line as the right arm to form a straight line. Twist the neck and look at the tip of the raised left arm. Release and repeat with the sides switched. The pose can be done while sitting although the original pose calls for standing as seen in the picture below. This pose stretches the muscles and improves flexibility in your arms, shoulders, upper back, and neck. Elongate the neck to a comfortable level. Inhale deeply and bend the right arm up towards your head in front of your face. The elbow is still maintained at shoulder level. Bend the left arm and bring it under the right arm to wrap around it. Try to bring the left palm to touch the right palm. Breathe deeply and hold the pose for ten breaths. Repeat with the sides switched. #10: The Spinal Twist: The Sanskrit name for the spinal twist is “ Vakrasana .” The pose removes stiffness of the spine and stretches both the shoulder and neck muscles. Sit down on the mat with the legs stretched straight ahead on the ground. Bend the left leg to bring the heel of left foot next to the right hip. Cross the right leg over the left knee and place the feet flat next to the left knee. Breathe deeply and raise the arms shoulder high. Place the left hand behind the back with palm flat on the floor. Breathe deeply and hold the position for ten breaths. Exhale and come back slowly to the starting position. Repeat by switching the sides. #11. Cow Face Arms: The pose is called “ Gomukhasana” or “cow face pose” because the pose resembles the face of a cow. The pose improves flexibility of muscles and removes stiffness in shoulders and neck. Sit on a mat in a cross-legged position. Slide the left foot under the right knee and bring it to touch the outer side of the right hip. Cross the right leg over the left leg. The right foot should be brought to touch the outside of the left hip. Take in a deep breath and lift your right arm up as close to the right ear as possible. Slowly exhale and bend the right elbow and place the hand so that the palm is flat and touches the space between the shoulder blades. Breathing in again slowly, take the left hand behind in a downward sweep. The elbow of the left hand is to the side of the mid trunk. Try to grasp the right hand with the left hand. Draw in your abdominal muscles and straighten the back and look ahead. Focus on keeping the spine straight and shoulders levelled without hunching. Breathe deeply and maintain the pose for one to two minutes or count ten breaths. Release slowly and repeat with the sides switched. #12: Upward plank: The upward plank pose counteracts the forward bending poses and balances the muscles involved in both forward and backward bending. The benefits of this pose called “Purvottanasana” include relaxation of neck and back muscles, along with a deep stretch of neck muscles that relieves spasms. The shoulder muscles also are stretched comfortably. Sit on the mat, keeping the back straight. Stretch the legs in front of you and keep the hands at least 12 to 16 inches behind the hips. Stretch the legs with the feet pointing upwards. Arch the neck backwards and stretch as much as possible. It is important to not throw the head back first before the maximum stretch of the chest is attained. Keep the head lifted and look at the knees initially until the chest is stretched to the maximum possible extent. Hold for 30 seconds or ten breaths and relax. Place the mat close to a wall that is free from paintings, nails or shelves. Exhale deeply and lie down on the back on the mat while stretching the legs on the wall. Keep the arms to the sides with the palms facing up. Breathe deeply and relax in the pose for ten minutes. #14: Child’s pose: The child’s pose is simple to do and called “ Balasana” in Sanskrit. Sit on a mat with knees bent and tucked below the hips and the back straight. Bend forwards as you inhale and try to bring your face to the space between your bent knees while the arms are outstretched on the ground. Keep the palms flat on the ground as you breathe deeply. Hold the pose for ten breaths and repeat. The child’s pose relieves tension in the neck, shoulders and back while eliminating neck pain. # 15: Relaxing pose: The “ Savasana” or the sleeping pose is recommended to be done at the conclusion of every yoga session to allow for maximum relaxation and relief of stress. For this pose, lie flat on a mat with the arms comfortably placed at the sides, the palms facing upwards. Keep the legs slightly apart. Close your eyes and focus on deep breathing, relaxing each muscle group consciously. Rest for ten to fifteen minutes. “Yoga” actually means “to unite” and the purpose of this ancient Indian practice is to unite the mind, body and soul in a holistic way. Yoga is a way of life rather than some isolated exercises or stretches and when practised under expert supervision yields benefits that go beyond physical wellness. Consulting a medical professional before taking up yoga is necessary for both beginners and advanced level practitioners.